In the last post, we learned that the pigs on Heather’s farm go through over 110 tons of feed every week. That’s a lot of feed! Heather and her family work hard to grow the feed for their pigs, purchase what they can’t grow, and mix the feed so the pigs have a balanced diet every day. The main feed for Heather’s pigs is a mixture of corn and soybean meal. Heather’s family grows most of the corn they use to feed their pigs. They also grow soybeans. They sell the soybeans to a nearby processor, and then buy soybean meal back from the processor. 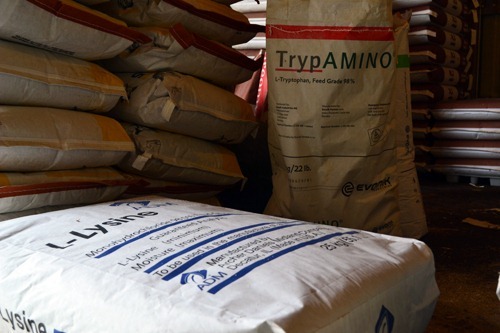 They may not end up with soybean meal that they grew to feed to their pigs, but it is from a farm in their area. These are some of the storage bins for corn and soybean meal on the farm. 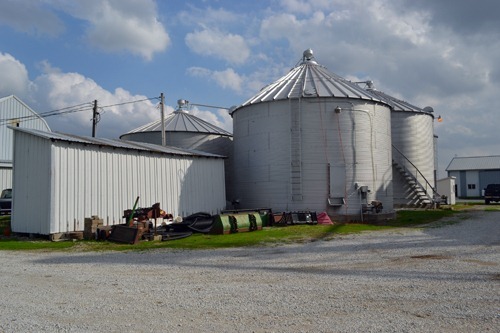 The small building to the right is the feed barn – all the feed mixing is done right on the farm, in this building. These are more storage bins for corn and soybean meal. 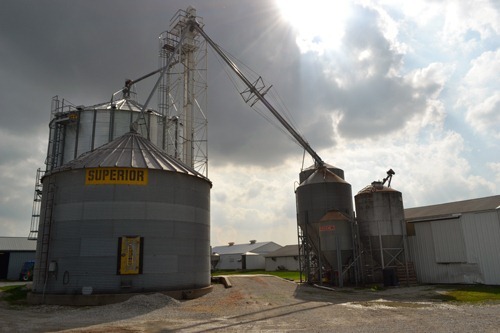 They have enough storage for 100,000 bushels of corn and 15,000 bushels of soybeans on their farm. They work with their veterinarian and a nutritionist to make sure that the pigs are being fed a complete and balanced diet. In addition to the corn and soybean meal, pigs need extra vitamins, minerals, and amino acids (building blocks of protein) for healthy growth. These are added to the feed mixture in the feed barn. Each group of pigs (pregnant sows, lactating sows, nursery piglets, and finishing pigs) gets a slightly different feed mixture, depending on their energy requirements and nutrition needs. 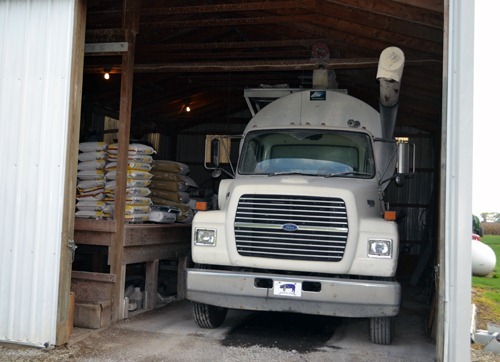 Once the feed is mixed, it is loaded into the feed truck. 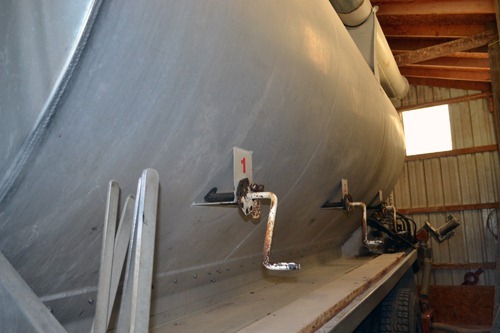 This truck has three internal compartments, so it can hold three different feed mixtures for three different growth stages. The feed is loaded into the truck, and then delivered to smaller holding bins outside each barn. In a normal year, Heather’s family grows about 95% of the corn they need to feed their pigs. This year, because of the drought in Indiana, they will only be able to grow 50% of the corn they need to feed their pigs all year, so they will need to purchase the rest. Unfortunately, good quality corn is not easy to come by right now. Because of the late rains we have had in Indiana, a lot of the corn is getting moldy in the field before it is harvested. This type of mold produces a toxin called aflatoxin that can be poisonous to animals. So Heather needs to be careful to purchase corn that is free of aflatoxin, or has it present in very low levels. Second, because of the drought, many farmers have less corn than in a normal year, so it’s going to be a little bit difficult to find the supply that they need. Finally, because the supply of corn is low, the price is going to be higher than normal this year. You may have noticed one big difference between feeding pigs and feeding dairy cows – where is the hay? Cattle need lots of grass and hay. The protozoa in their rumens digest the cellulose and fiber in the hay into nutrition for the cows. Pigs don’t have rumens, and they don’t have protozoa! In fact, pigs’ stomachs are very similar to peoples’ stomachs! Because they don’t have protozoa like cows, they can’t digest grass and hay into usable nutrition. My piglets grows slowly I’ve given all medication but no help what is the best solution? You will have to reach out to your local veterinarian for help. I cannot give any medical advice.